Daily Illuminator: Munchkin Cthulhu Game Day Locations! April 28, 2017: Munchkin Cthulhu Game Day Locations! Tentacles . . . why'd it have to be tentacles?! Because it's Munchkin Cthulhu Game Day! 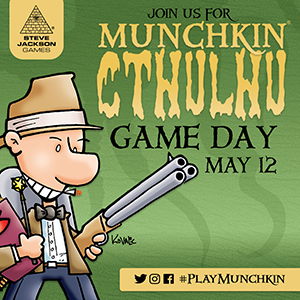 Visit a participating friendly local game store on the weekend of May 13 (see store for event date and time) to play Munchkin Cthulhu with other cultists . . . I mean, gamers! Stores were given free kits packed with Munchkin Cthulhu swag like exclusive bookmarks, new Cthulhu promos, a poster, and even a demo game! With all that free loot, you'll be trashing Old Ones in no time. On the weekend of the event, if you post a pic of yourself playing Munchkin Cthulhu on social media and tag it with #PlayMunchkin, you'll be entered to win a sweet Cthulhu-themed prize pack! Make sure you tag your store as well, so they'll be entered to win something special, too! Cthulhu is feeling quite generous. So make your way to a participating retailer on the weekend of May 13 and play Munchkin Cthulhu! The fate of the world may very well depend on it.